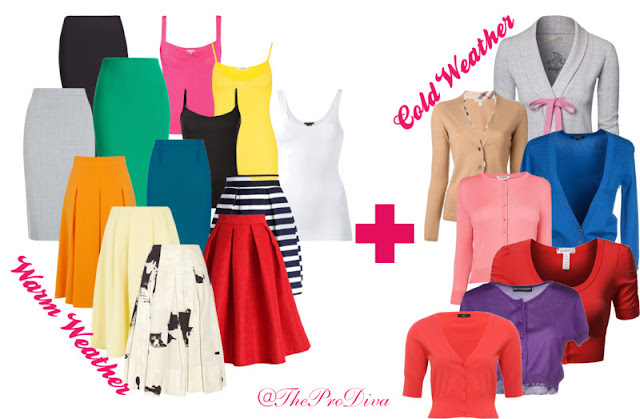 THE MARTINI CHRONICLES: Summer Workwear: Dressing for the Outside Heat and the Chilly Office! 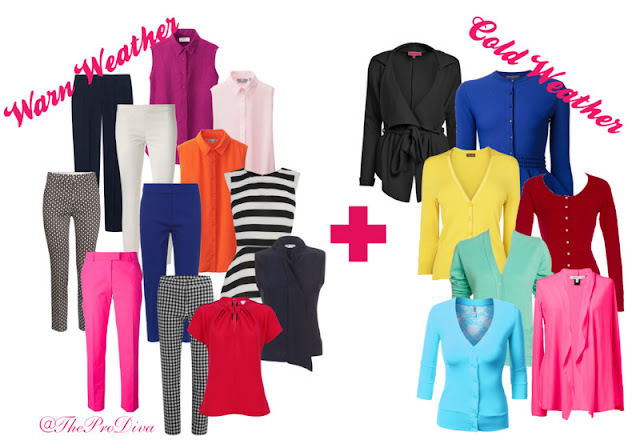 Summer Workwear: Dressing for the Outside Heat and the Chilly Office! Greetings Divas! Like many of you, I am really excited to bask in the summer weather; especially with the terrible winter we had in the northeast. The summer also gives us an opportunity to switch up our wardrobe. My wooly pants, skirts, and suits and long-sleeved dresses take a back seat to thinner fabrics and sleeveless sheaths. There are a few cold-weather items, however, that tend to creep their way into my warm-weather wardrobe. Why? Well...like many offices, the warm weather outside is a stark contrast to the cold, air-conditioned office environment. How many of you can attest to the arctic tundra that your office becomes during the summer months? I realized this was a problem several years ago. Once I recognized that there was nothing I could do about it, I adapted! This was a much better option than wrapping myself in a Snuggie and rocking back and forth at my desk praying that I won't get frost bite. That being said, I've come up with a few warm weather/cold weather combos that will help you dress for the heat outside, and survive the cold inside. Check it out! The Warm Weather Problem: We've already established that dresses are a fantastic alternative to the classic suit, especially if you are spending the day in the office. Dresses are chic and feminine, and are easy to slip on in the mornings with a cute pair of heels. While long-sleeved dresses are popular in the winter and fall, you may find yourself a little uncomfortable when standing outdoors with all of that extra fabric. In the warm weather, short-sleeved or sleeveless dresses are great..that is until you step into the AC. The Warm Weather Fix: Pair your short-sleeved or sleeveless dress with a fitted blazer. 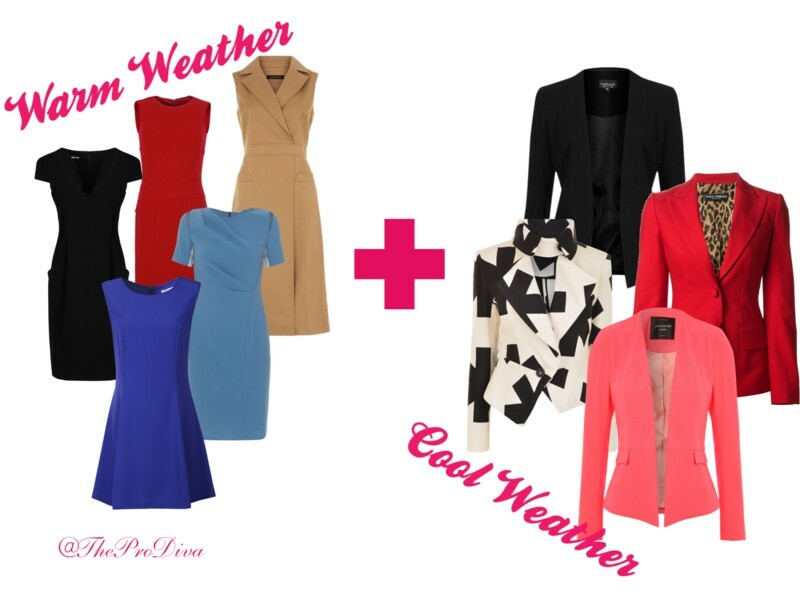 Try to snag some fashion-forward blazers with bright colors; they will look great with a solid-colored dress. If you're really feeling ambitious, try to snag a few blazers with elaborate patterns. This is a great way to jazz up your outfit. When you're done for the day and are ready to head outside, remove the blazer and go! *Tip: I usually keep one or two blazers in my office, just in case I forget to grab one when I leave the house. The Warm Weather Problem: Dress slacks and blouses are an office staple; especially in a business-casual work environment. In the summer, it is not unusual for us girls to trade in our long-sleeved blouses for those of the short-sleeved or sleeveless variety. After all, short sleeves are germane to the warmer weather. But when you walk in to the A.C.-filled office, all bets are off and you start longing for something to cover up your arms. The Warm Weather Fix: The cardigan is the perfect fix for your dilemma. And with all of the different variety of cardigans on the market, you are sure to find some that suit your particular style. Pair your cardigan with dress slack and a blouse (or dress shirt, or peplum, or wrap shirt), and keep yourself warm in the office...while still looking stylish! When you head back out to the heat, take off the cardigan show off those arms! The Warm Weather Problem...and a Natural Fix: Now, ordinarily I would not advocate wearing a skirt and a tank top in the office without some sought of cover up. As luck would have it, pairing a cardigan with a skirt works perfectly when transitioning from the warm outdoor weather to a cool office. Here's how you do it: (1) Pair a flared skirt with a matching tank and a cropped cardigan, or (2) Pair a pencil skirt with a tank and a buttoned-down cardigan. Both options present a clean and polished look that works well in the office. When work is done and you are headed back outside into the heat, ditch the cardigan! These are just a few combos to help you transition between the outdoor heat and the indoor chill. Please be mindful, however, of your office dress code when taking advantage of these options, as they are not appropriate for every workplace. Use your discretion to ensure that you are appropriately dressed...and perpetually stylish! Have a great week Divas! Your summer is my reality 365 this is how my work wardrobe looks, too bad some don't understand what it means to dress appropriately.